The first Chevy trucks came to fruition in 1918, when Chevrolet was still a young upstart of a manufacturer. They soon teamed with General Motors to design a vehicle to compete with the market dominating Ford Model TT. It wasn�t until the late 1940s and into the 1950s that the Chevy truck came into its own with an elegant styling and signature design that set it apart. From the C/K series, the Silverado and the Avalanche, right up to today�s impressive models, Chevrolet has maintained a tradition for sturdy, attractive and muscular vehicles. The Chevy trucks neon clock celebrates the manufacturer�s legacy with a great image of its classic bow tie logo against a white background. The entire design was developed to evoke a nostalgic feel for the type of clock you might see hanging in a road side diner or garage in the 1950s. Yet it has also been engineered with the finest technology available to ensure a long lasting and impressive performance. Its body is hand spun, made of an aluminum bezel with a powder coated finish. The 20 inch face is protected by a crystal clear single strength glass that�s no less than 5/32 of an inch thick. Inside, a 1/2 inch glass tube provides a soft neon glow that accents the Chevy trucks neon clock�s colors. That glow promises to last over 100,000 hours � more than 11 years. The clock has a separate set stem, an eight foot 110-volt power cord and a separate neon light switch. The clock has a sweeping second hand that rotates smoothly, enhancing accuracy and attractiveness. This time piece will look great in the garage, auto shop, diner, family room or man cave. The Chevy truck neon clock will be a great addition to any environment. 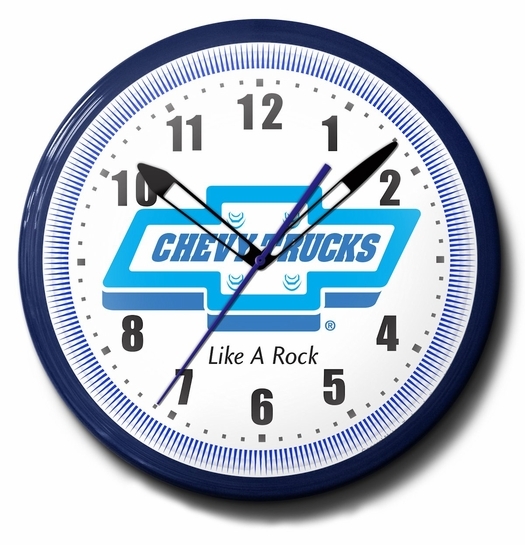 Ask a question about Chevy Trucks Neon Clock: High Quality - Like A Rock, 20 Inch.